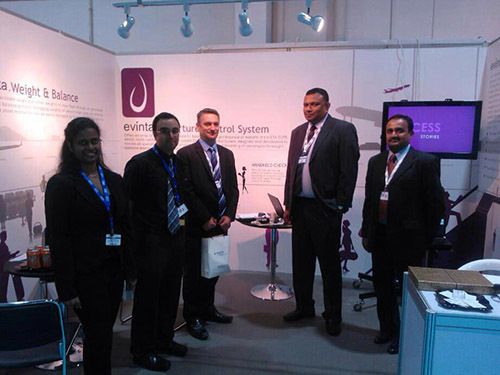 Evinta Aviation Solutions by John Keells computer Services opened its doors to visitors at one of the world's largest airport-focused exhibitions : The Airport Show 2014 in Dubai today! Colombo, Sri Lanka, 11th May 2014,-The Evinta Departure Control System, Airport Resource Planning system and a groundbreaking Evinta Hand Held check in system will all be on display at the Dubai Airport Show from 11th to 13th May at the Evinta Exhibition space (Stall no 7520 – Hall 7) at Dubai International Convention and Exhibition Center. Held in Dubai annually, the show is a renowned B2B platform for companies to present airport and aviation-related products and services for the Middle East, South Asian and North African regions. In 2013, the event gathered 6,581 aviation professionals who networked, sourced their product requirements and created over US$20 billion worth of business. Since its inception in 2009, The Sri Lankan based Evinta suite has secured leading star class airlines and airports specially in the Middle East, Asian and African regions continuously for it’s showcase of client logo’s. Today over ten million passengers are booked annually on Evinta systems currently in operation at airlines and airports across the globe in 6 Continents. Backed by its cloud based platform, the fully customizable product portfolio comes with customer centric pricing schemes and reliable 24/7 support for the system. In addition to the Airport portfolio, on the Airlines front Evinta Airline solutions offers a complete package with its Internet Booking Engine, Loyalty System and RESPLAN module. (www.jkcsworld.com / www.jkcsworld.co.uk). Evinta’s participation this year is in the 14th edition of the show held under the patronage of H.H. Sheikh Ahmed bin Saeed Al Maktoum, President of the Dubai Civil Aviation Authority, Chairman of Dubai Airports and Chairman and Chief Executive of Emirates Airline Group.